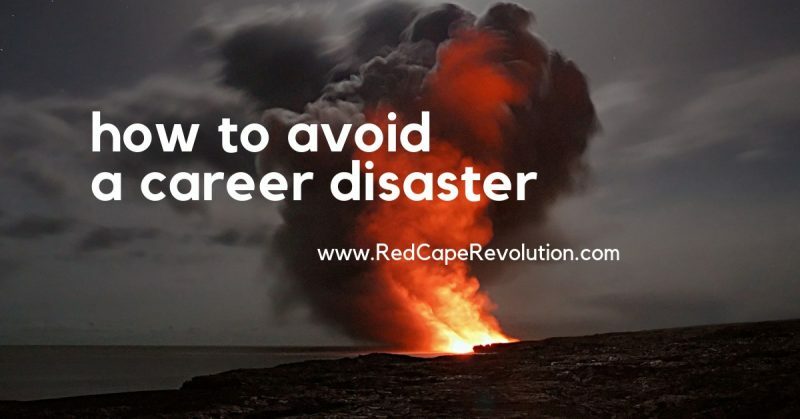 Are you prepared for a career disaster of epic proportions? Because no matter how good you are at your work, or how valuable you are to your company, the reality is that career disasters happen every single day. Like what happened to Jake . . .
Jake, a management consultant, sent an email to his friend ranting about a recent meeting with a client. The client fired the firm. And eventually, the firm fired Jake. Career disaster for the once high-flying Jake. Or think about Angela’s scenario . . .
Angela’s consumer products company suddenly announces they’re selling to a competitor. The competitor has a full staff in Angela’s area of finance. Angela’s not needed; the cost savings from her role are. She’s out. Career disaster with very little warning for Angela. The lesson: Don’t get complacent. No matter what your role or business, this can happen to you. Even people who own their own business can experience a shift in customer expectations, government regulations, or staff that can make their business go from soaring to survival mode. In a fast moving and always changing world of work, there’s more chance than ever that an avalanche will tumble into your sweet little career path, blocking roads you thought you had. Unfortunately, there’s no Red Cross for the next time your career hits Category 4 status. And hoping it never happens to you just leaves you devastated when it does. You’ve got to be prepared. And it’s easier than you think. But you’ve got to start now. 1. Build your network, inside and outside your company. When the eye of the career storm hits, who can you trust? Who will trust you back, or listen to you, and even offer to help you? That’s the job of your network–the community of people who know, like and trust you. Here’s the truth–you’re not alone. Almost everyone hates the old-school, badly managed form of networking that involves going to a stupid event, passing cards around, and making small talk. And it’s a waste of time and energy. So let’s not do that. Instead, let’s build great, interesting relationships, one at a time. Your friend in sales may be the first to know that the quarter is down and layoff talk is starting . . . Your colleague in your own department may be in the meetings where concerns are voiced . . . The person you see once in a while at a professional association meeting may hear news about your company that you’re not hearing . . .
And the best time to build those relationships is NOW, when all is well. Because when career disaster hits, it’s too late to prepare. Make networking easy with my free guide, How to Network While You Work. It outlines your plan for who, when, what to say, and what to do to start building your network right now. Let’s say you go down screaming in virtual career flames. Just like in any natural disaster, having a plan ahead of time helps take away the confusion and randomness of our decisions during a stressful time. And even if you think your career’s not at risk, it’s a good time right now to get that plan in place. Clarity and confidence to describe your superpowers and strengths. A well cared-for network (see #1 above). A well cared-for LinkedIn profile (get help here). A clear picture of your current financial situation (what you’re making and what you’re spending). Having these foundational things in place now helps reduce your panic and stress later. Here is my 100% guarantee to you: if you’re human, sometime you’re gonna screw up. And most of the time, it’ll be okay. But sometime, it might lead to a career disaster. Making mistakes is part of the human operating system–it’s in our user manual. So, since we know mistakes and disasters are inevitable, it’s even more important that we start expecting them. Planning for them. Or taking focused action to protect ourselves. But do it now. You’ll thank yourself for it when the disaster hits. How ’bout you? How will you avoid a career disaster? Investing in your own professional growth through coaching can be just the disaster prevention tool you need. Don’t wait–be ready now.